Bi-folding doors are one of the most desirable ways to improve your property. The installation of bi-folding doors can really add a touch of class to your property and can make you the envy of the neighbourhood with their sleek design and effortless style. The large glass panels of these beautiful doors will increase the amount of natural sunlight that enters your home making for a brighter and more relaxing interior environment. 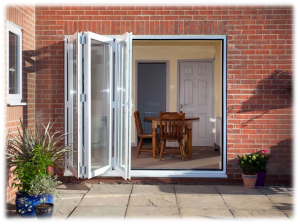 Ideal for entertaining, these doors will seamlessly connect your home and garden making them perfect for barbecues or children’s parties. They are practical too, as when fully open they provide easy access to your property allowing you to move larger items such as furniture or white goods. FineGlaze specialise in bi-folding doors from Origin, ALUK and Raynear. Why Choose Bi-Folding Doors from FineGlaze? We install ‘Bi-Fold Plus’ doors which are one of the leading bi-folding doors products available in the marketplace. Bi-folding doors are designed so that the hardware is concealed with only the knuckle visible, making for a sleeker and smoother appearance. 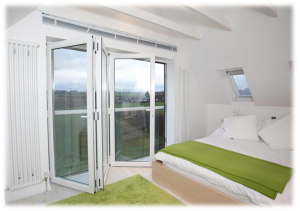 They have ultra-slim frames which means they contain more glass and less UPVC frame by area. This means you will benefit from better views of outside and gain more light within your property. Available in a range of colours you can tailor your doors to complement your home and achieve the look you desire. We can supply bi-folding doors in white, cream, oak or rosewood as standard but if you are looking for something that little bit different then many alternative colour options are available. The handles and hinges come in white, chrome or gold options so you can choose the look that best suits your personal taste. You can also match them to your windows to create a seamless façade to your home. With the option of internal or external opening, bi-folding doors are suitable for multiple applications. They can be used to connect your home to your garden but are also effective as an internal room-divider. For example, they create a stylish and elegant way to separate your main home from your conservatory. These doors are available with a low-threshold option making them less of a tripping hazard for children or the elderly. The ultra-low threshold option is just 24mm high making them perfect for a family home. There is also the option to have the low threshold sit in a tray which creates an access ramp for wheelchair users. These stunning bi-fold doors are available from 2-6 metres wide meaning they are suited to properties both large and small. The slim-frames will provide you with an unobstructed view of up to 90% of the surface area. There are many different opening configurations to choose from, so you can bespoke your bi-folding doors to suit your individual requirements. Bi-folding doors are completely lead free making them an excellent environmentally friendly choice. They have been tested to British Standard Weather performance criteria meaning they will withstand the harshest of weather conditions. Made from durable UPVC, they are robust and low maintenance. You will only need to clean them from time to time to keep them looking shiny and new. For your peace of mind, bi-folding doors are fitted with a shootbolt locking mechanism which fastens solidly into the steel track. This maximises security, keeping the contents of your home safe and sound. They are easy to operate and provide a durable and functional entrance to your home. For more information on doors why not contact us and speak with one of our expert advisers today? Click Here to Download Our Raynaer Brochure. Click Here to Download Our ALUK Brochure. Click Here to Download Our Origin Brochure. We provide bi-folding doors in Aylesbury, Dunstable, Leighton Buzzard, Milton Keynes, Tring, and all areas throughout Buckinghamshire and nearby locations.